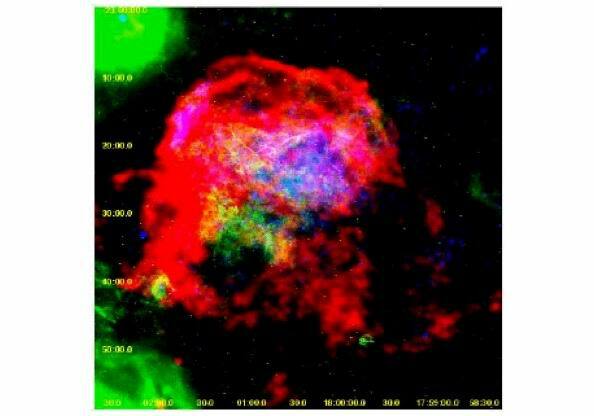 Stellar remnants of Supernova explosions. 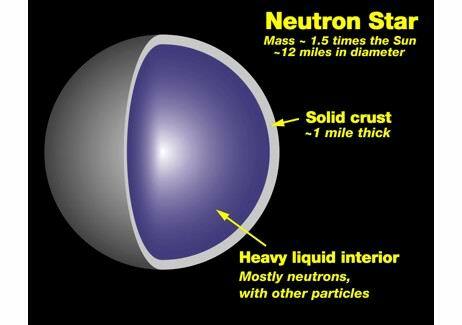 If the star is relatively low mass, roughly M<25M⊙, it can be supported by neutron degeneracy and becomes a neutron star. 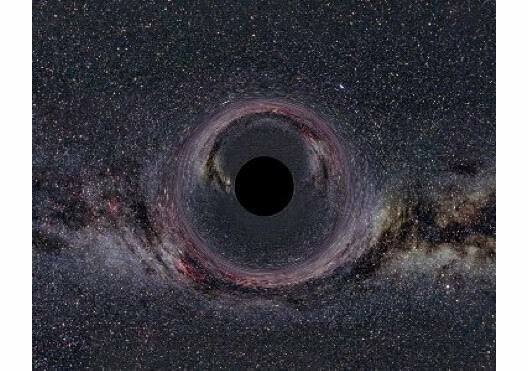 For more massive stars, the gravitational attraction overcomes neutron degeneracy, and the core collapses to form a black hole. Shell-type SNR (e.g. Cas A). 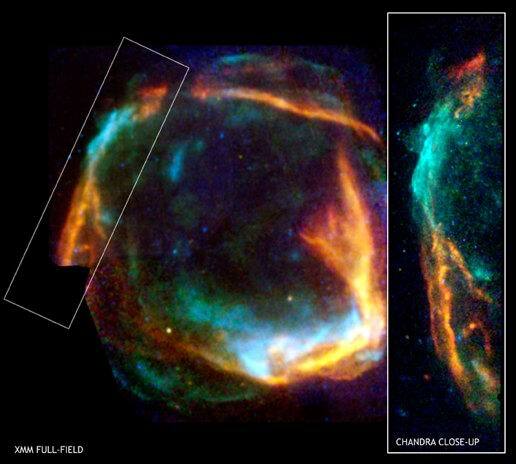 The central ring is due to ejection by a stellar wind prior to the explosion. Glows due to [OIII] emission, excited by radiation from the explosion. 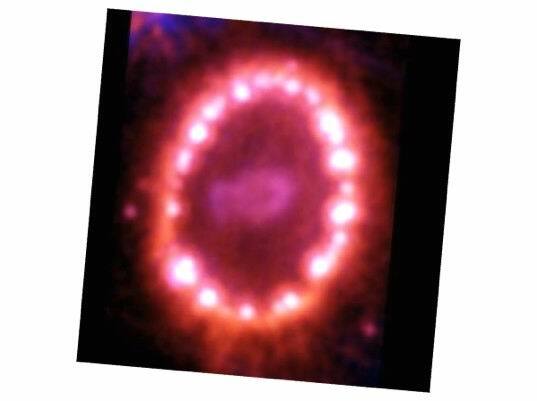 When the shock wave from the explosion reached this ring, in 2004, it excited the gas causing it to glow brightly. The two other rings are not in the plane of the explosion, but in front of and behind the star. The explanation of these rings is still unknown. 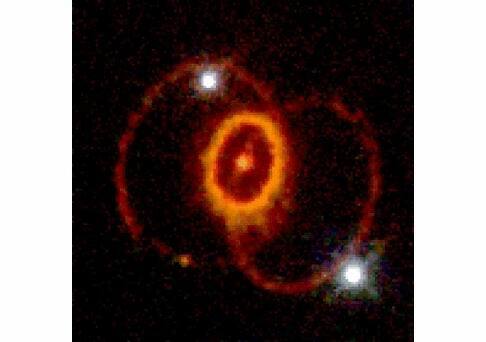 An enlarged image of the central ring, due to gas excited by the SN shock. X-ray, radio, and optical emission come from a shell. X-rays are usually thermal, but can have non-thermal components. 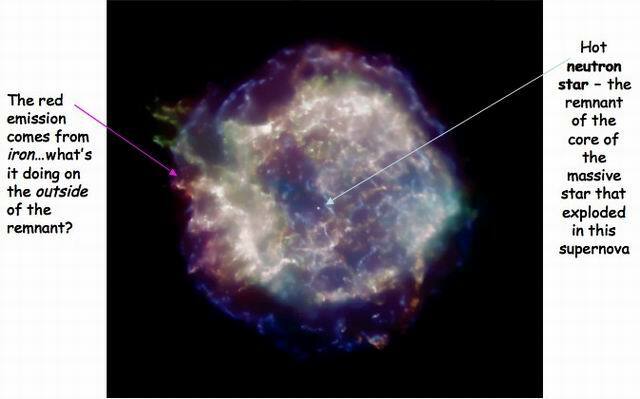 Power source is inertia left from initial supernova. No current input of energy. 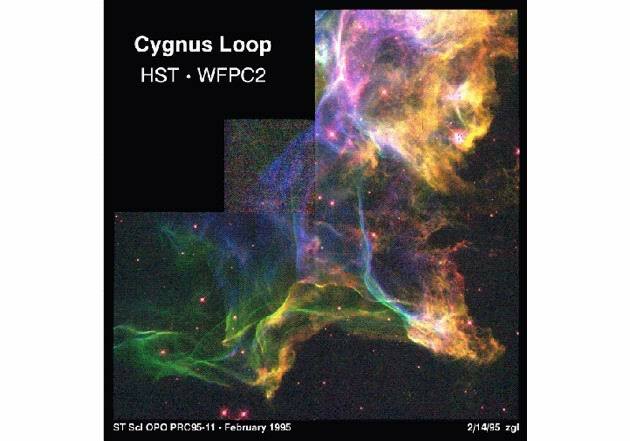 Cygnus loop: this is a ~15,000 year old remnant. 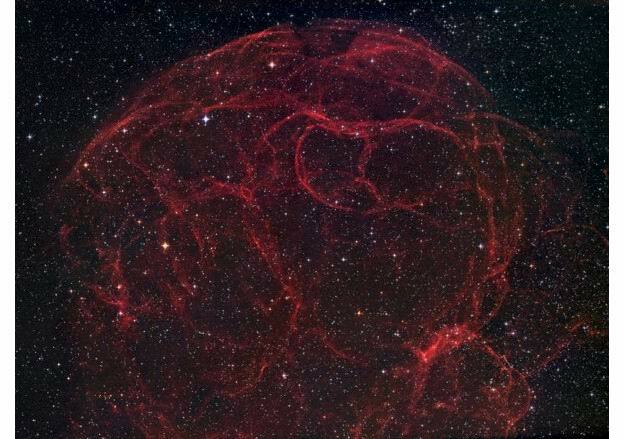 The filaments are caused by shocks encountering the interstellar medium. These shocks excite the gas which then emits emission lines. 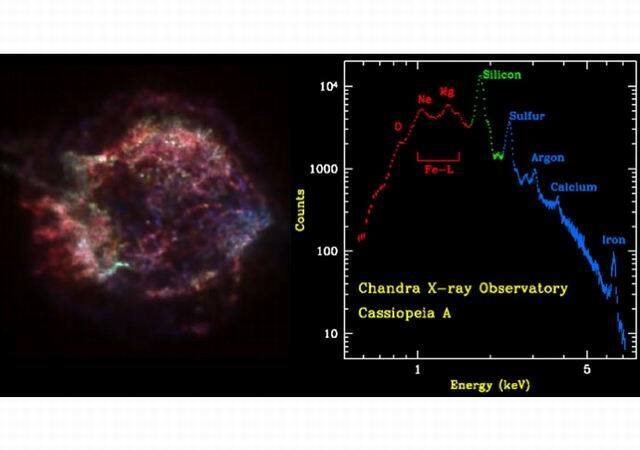 X-ray, radio, and optical emission come from a filled, central region. X-rays are non-thermal. Motions can be detected internal to the nebula. Continuously powered by relativistic wind from pulsar at center of nebula. The Crab nebula is ~2 kpc away, with an angular size of 4×2 arcminutes. The expansion velocity is measured from the Doppler shift to be 1450 km/s. 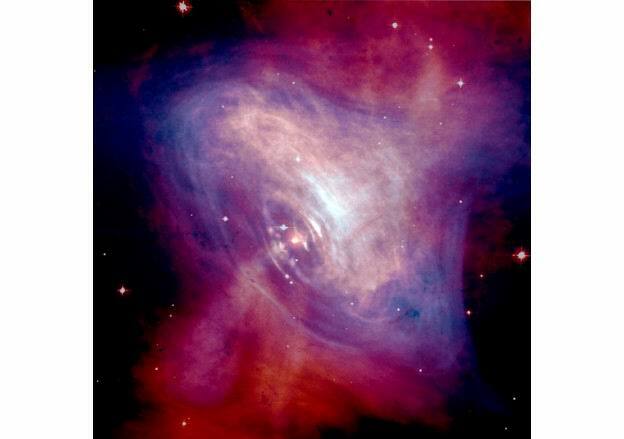 The source of the luminosity and electrons is a pulsar in the centre of the nebula. Exercise: estimate the age of the nebula. 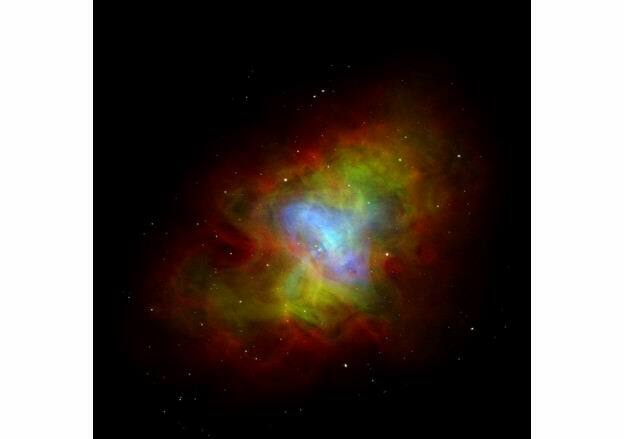 How bright would the supernova that gave rise to the Crab nebula have been? 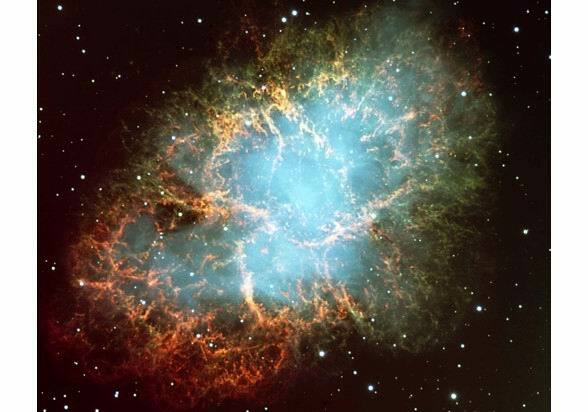 Crab nebula: believed to be the remnant of the supernova that went off in 1054 A.D. 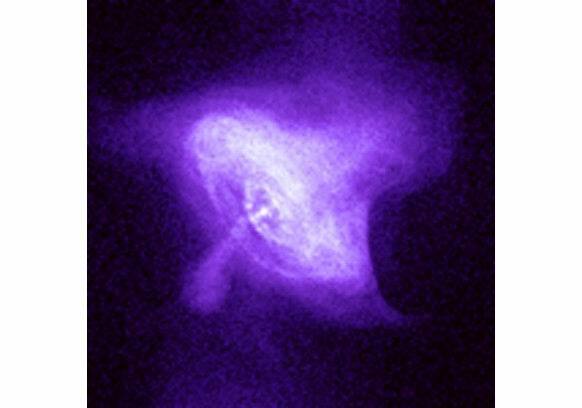 Combined optical (Hubble) and X-ray (Chandra) image of the Crab pulsar. Courtesy of NASA. Plerionic composite: shell-type on the outside, Crab-like at the center. Thermal composite: Radio shell, center-filled X-ray emission, but X-rays are thermal. Thought to occur in denser ISM than shell-type SNR. X-rays may be due to evaporation of clouds ISM after shock front has passed.